If you want to buy a car with no title, you should first realize the many risks and pitfalls involved. 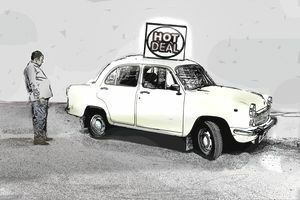 In order to drive a car on public roads, you will need to have insurance and proper registration, and for that, you will need to secure the vehicle’s title – so even if you are willing to buy a car with no title, you definitely should not even think about trying to drive a car with no title. When you are buying a car and the salesperson (or more likely, random individual) tells you the title is unavailable, this should raise red flags for you. In some cases, the person you are buying the vehicle from may have a perfectly legitimate reason for not having the vehicle title. Maybe their elderly relative was the owner of the car and that relative tragically passed away with their documents out of order. Or maybe the individual who owns the car isn’t too organized themselves and has misplaced the necessary documents. But other times, the reason is more sinister. Over 700,000 cars are stolen per year in the United States, and far from all of them are ever recovered. While some are wrecked or sent overseas, many others are sold on the black market – including to purchasers who are willing to forego getting a title with their new car. Before you buy a title-less car, make sure to take the following steps to protect yourself. Before you even think about buying a car without a title, you should arm yourself with full information about the vehicle’s history. Ask for the VIN so that you can obtain an accident history and a full record of ownership. If the car was terribly damaged, if the car is listed as having a salvage title, or the vehicle has an owner listed who is not the one trying to sell you the vehicle, be extremely cautious. A salvage title vehicle is one that was seriously damaged to the point that an insurance company deemed it was not worth fixing. You need to be aware that in most states, you’ll be unable to drive a salvage title on the road or even obtain insurance for it unless it has been inspected and reclassified. Even if you’ve done your proper research, a detailed car history may not be as up-to-date as you need, so it will pay in the long run to have your own independent inspection performed on the vehicle to insure it’s in good and working condition. If the owner is truly a legitimate one and you have done your proper research, you should ask the owner to obtain a new title from the DMV – they’ll simply need to bring their license and license plates and sometimes pay a small fee. Do not let them convince you to take on this task on your own: because of the high amount of stolen vehicles on the road, a DMV is going to be extremely reluctant to grant a title to someone not listed as the owner of the vehicle. If the owner is not willing to put in the small amount of work required to get a new title, nor wait the short amount of time it will take to get the title, you probably should not trust them enough to purchase a vehicle from them in the first place. A much riskier way to take ownership of the car is to request a bonded title. In effect, you’ll attest in a signed document that the car was gifted or sold to you and, if no one challenges your ownership for the next 1-3 years (depending on the state laws), the car will be yours. This title will need to be issued by an insurance company and you will have to have an appraisal. This is a risky method of obtaining title, especially if there’s any chance that the vehicle was stolen. Once you’ve agreed to buy the vehicle, make sure you have a legally binding bill of sale. Otherwise, if the vehicle is a stolen one, you could be on the hook if the police see you driving it. Once you have the regular or bonded title, you can proceed to register the vehicle with your insurance and with the DMV just like you would any other new or used vehicle. You are better off avoiding purchasing a car without a title but if you have your heart set on it be sure to do your research, request an inspection, get a duplicate title, get your paperwork, and be sure to register the vehicle.